This may be one of my favorite salads to date! And that’s saying a lot considering we have heavy hitters like our Loaded Kale Salad and Garlicky Kale Salad with Crispy Chickpeas (both of which are total home runs). This seasonal salad relies on winter squash, my favorite 5-Minute Macadamia Nut Cheese, pepitas, and dried currants for ultimate flavor. And the 1-ingredient dressing? Yeah, it’s that easy (and utterly delicious). Let me show you how. This salad comes together with 10 ingredients in 30 minutes! It all starts with roasted acorn squash, which only takes about 10-15 minutes to roast. While that’s happening, start your balsamic reduction (which is simply balsamic vinegar reduced by half until you achieve a dreamy glaze). Another amazing element to this salad is the crispy sautéed shallot. Simply slice shallot, toss in brown rice flour and salt, and sauté until crispy. It’s pure magic and you’ll never want to eat a salad again without these on top. I promise you. This would make the perfect side dish for the holidays! Or make it a main by adding our Actually Crispy Baked Chickpeas. If you’re into salads, be sure to check out our Abundance Kale Salad With Savory Dressing, Roasted Vegetable Salad With Chimichurri, Curry Roasted Fennel Salad with Rosemary Tahini Dressing, and Curried Cauliflower Grape and Lentil Salad. 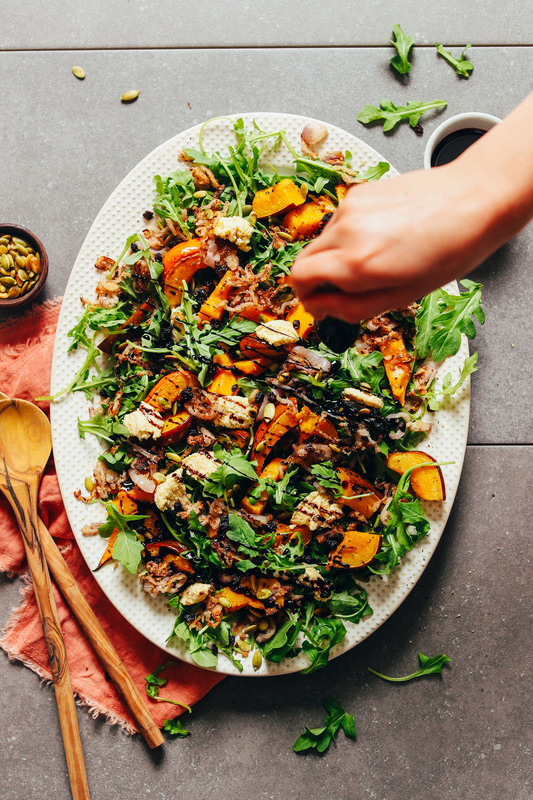 An incredibly flavorful fall roasted squash salad with macadamia nut cheese, crispy shallot, and balsamic reduction! A hearty side or main. Just 30 minute and 10 ingredients required! Preheat oven to 425 F (218 C). To prepare squash, use a sharp knife to carefully cut in half lengthwise (from root to tip), then remove seeds with a spoon or ice scream scooper. Slice squash halves into even wedges and leave the skin on. 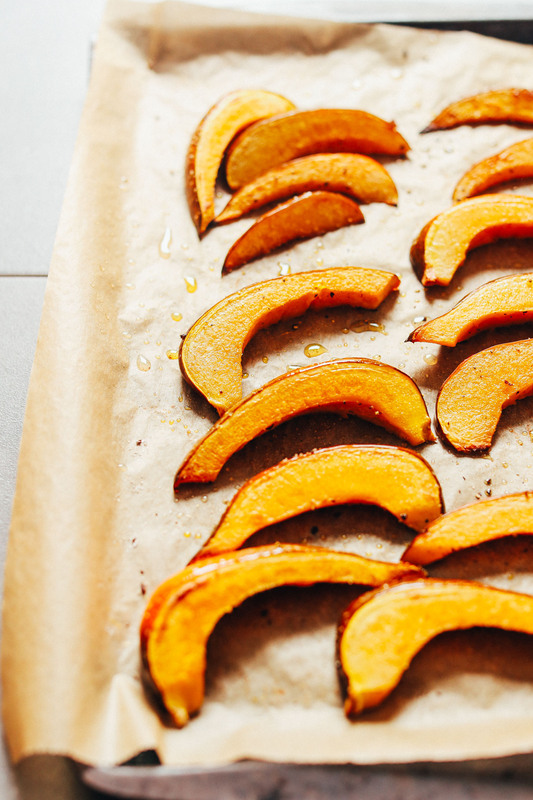 Arrange squash on a parchment-lined baking sheet. Sprinkle with oil, salt, and pepper and toss to coat. Spread in an even layer.Roast squash for ~15-20 minutes or until tender and golden brown. In the meantime, prepare dressing by adding balsamic vinegar to a small saucepan. Bring to a gentle boil. Then allow to simmer until it is reduced by half and looks thick (about 10-15 minutes). Watch carefully near the end as it can go from reduced to burnt quickly. You’ll know it’s done when, swirled, it coats the sides of the pan. At this time, prepare the nut cheese (link to recipe above), or if using store-bought, skip this step. If toasting pepitas, add to a dry skillet over medium heat and cook, stirring occasionally, until lightly browned - about 3-5 minutes (being careful not to burn). Next, add sliced shallots to a small bowl with brown rice flour, salt, and pepper and toss to coat. Heat a medium (preferably cast-iron) skillet over medium heat. Once hot, add oil and floured shallots and sauté, stirring occasionally, until lightly golden brown and crispy - ~5 minutes. 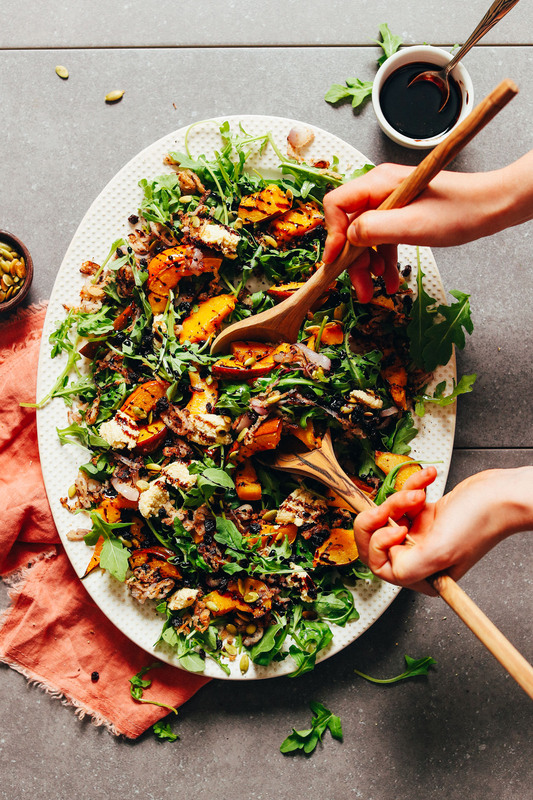 To serve, arrange arugula on a platter or serving bowl and top with roasted squash, crispy shallots, dollops of macadamia nut cheese, pepitas, and cranberries or currants. Drizzle with dressing. Best when fresh, but leftovers can be stored covered in the refrigerator up to 2-3 days (preferably without dressing and squash separate from greens). *Nutrition information is a rough estimate calculated with all of the dressing and with a combination of avocado and olive oil. I didn’t made the recipe yet, it’s on my list! But, scrolling through all the recipes, I find it difficult for me to find recipes without nightshades or just a specific type of recipes. It would be nice to classify the recipes better then super large categories. It would be faster and easier to find vegan-breakfast or nightshade-free dinner! This was amazing. The ONLY dish people went back for seconds at Thanksgiving dinner. I did have a few leftovers with it all mixed together-dressing and squash-and had it for lunch the next day and it was magical. Making it again for lunch tomorrow with some butternut squash for my après ski meal and wine. Yay! We’re glad that it was a hit, Christy! This salad is fantastic! So flavorful and a great balance of textures. Love the balsamic reduction! Can i use a different flour then rice flour? Yes, though we haven’t tested this recipe with other flours and can’t offer suggestions! If you experiment with it, report back on how it goes. Good luck! 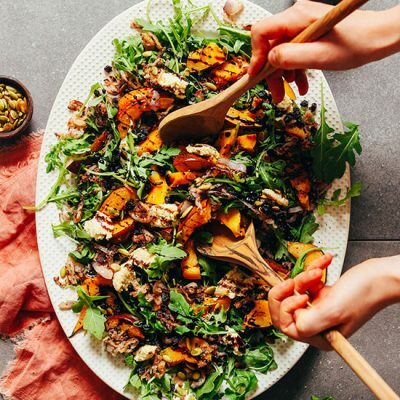 This salad is beautiful and met some of my omnivore partner’s likes (arugula, dried berries, pepitas, basalmic reduction), but not all (squash is suspect). This was amazing. I wasn’t sure as I brought it all together, my attempt at the shallots was lackluster and since we don’t do squash a lot I was worried that it wasn’t done enough. I cooked an extra 5 minutes as my slices were chunky. It was amazing. Definitely going into the meal planning rotation. We both loved it. Dana-you are amazing. Thank you. The store didn’t have any squash (other than spaghetti) but I was DETERMINED to make this so used roasted cauliflower instead. Obviously changes the flavoring but was still SO delicious. However, I am (slightly) ruined because I now need crispy shallots on every salad going forward. I made this for a work potluck and it was a huge success. Normally I would be turned off by squash with the rind still on, but it actually adds a nice texture. I was pressed for time so I subbed Kite Hill Ricotta for the macadamia nut cheese and it was dreamy. I’ll be making this again. Whoop! We’re glad to hear that, Karlie! I followed this recipe to a T, adding everything optional. It was off the charts good. It was beautiful and gourmet, and all the flavors melded so wonderfully. My husband said it was the best salad he ever had. The macadamia cheese was the bomb. 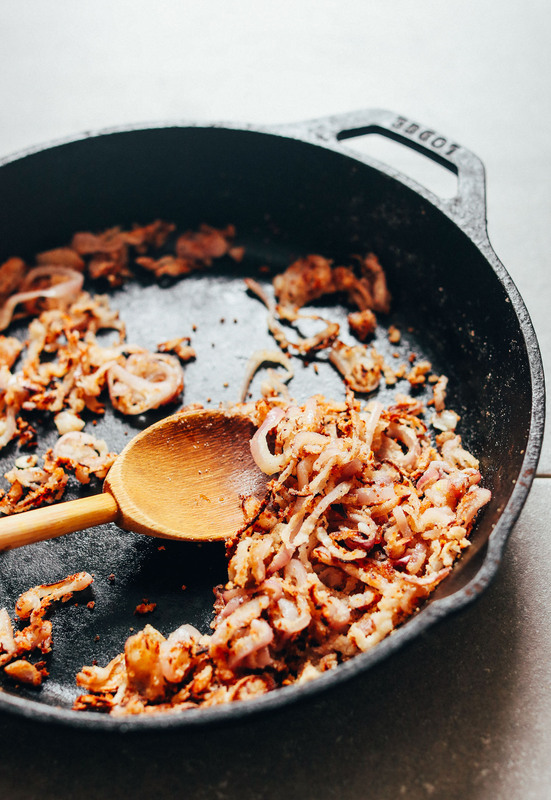 The shallots…dang! Just everything I about it. Thank you!!! Just made this today. Such a good recipe. Every ingredient added so much awesome flavor. Even picky eaters in the family loved it. Very yummy fall/winter salad. Fantastic recipe! Made it for my Thanksgiving contribution and forgot the balsamic reduction at home. And it was still delicious! Thanks! I meant to say after the amount of water needed I had to slowly add an addtional tablespoon of water to make the paste for the cheese. I made the macadamia cheese after soaking it for one hour in hot water; but my Cuisinart Food Processor made it slow; it took ten minutes and as you mentioned 1tbs more each time. It is perfect; the squash I had used was already cut and frozen (organic); they are a little mushy but that is okay, it is for me only; I wanted greens and cranberry sauce; instead I got a salad that has dried cranberries, squash and argula; this is a wonderful way to eat well and enjoy the day. I love your recipes thank you. This recipe was way better then I expected it to be (and I was expecting it to be great)!! I make a lot of your recipes, but this is the first time I’ve commented. You come up with such wonderful recipes and I hope I can be as creative as you someday! I didn’t have a lemon for the cheese but it really needs it. I can still add it to the leftovers though. I was tempted to add sugar to the reduction because I wanted something thicker (and sweeter), but I didn’t for health reasons. I added some cornstarch and it thickened up beautifully. When everything came together its was soooo good! Thanks! This salad is a. maz. ing! 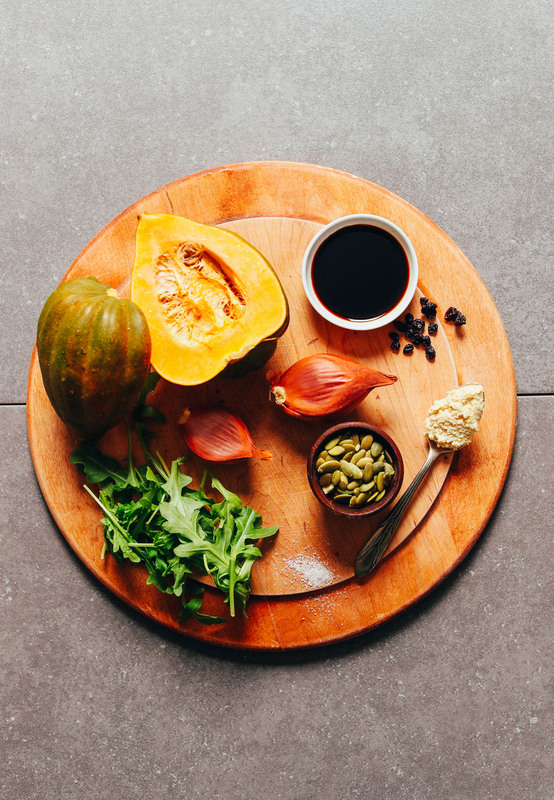 So many beautiful flavors coming together make it a perfect fall salad. I am not vegan so I used crumbled feta for the cheese and it was delicious. I also substituted sweet potatoes for the squash. Really, really loved this. I immediately marked it as a favorite and will be making it again. Yum!!! Hey Dana! I made this for a lunch birthday today. :) One question, “1/8 tsp each sea salt,” does that mean 1/8 per shallot, since you said “each?” I did just a 1/8, and that taste right, but just making sure for Thanksgiving! Looks amazing! Could I use chickpea flour? I have extra from the (amazing) socca. Hi Elle! It will taste much different with chickpea flour. If you can I’d recommend another neutral gluten-free flour, such as white rice or even cornstarch or arrowroot. Didn’t make this but I will. Every recipe I’ve ever made of yours are fantastic. I absolutely love your work and tell everyone that is trying to go plant based about your website. Thanks for being fabulous humans. Will a diff type of flour still work well with this recipe? I have a TON of chickpea flower I’m dying to use, do you know if it will have the same effect? Hmm, it will taste much different. If you can I’d recommend another neutral gluten-free flour, such as white rice or even cornstarch or arrowroot. I made this and forgot the pepitas! Taste was amazing but I really missed that crunch. Next time I will remember! Love the balsamic reduction, I could actually eat that on it’s own. And the mac cheese was great! My first time making vegan cheese and it really wasn’t as hard as I thought it would be. I’m beginning to really love nutritional yeast. Can you make the fried shallots and advance or only right before you serve the salad? Making it tonight for dinner party, looks amazing ! Hi Ellen! You can make them ahead of time, though they are best fresh! I make them before (and squash), wrap in foil, refrigerate and reheat in oven before serving. What would be a non-vegan option to sub for the nut cheese? Can’t wait to try this! Hmm, any cheese of your choice! goat cheese or feta. but don’t be deterred by the macadamia nut cheese, it is delicious. Do you cut the squash before cooking or cut after cooking? I’ll add more details to the instructions. But you slice the squash into half lengthwise, remove seeds, then slice into even wedges / slices. Leave the skin on. Cut in half scoop out seeds. Leave skin on. Place on counter and slice into thin slices. Place on baking sheet and bake in oven as directed above. It’s THAT simple :) hope this helps all of you! Any substitute for brown rice flour? Almond or coconut flour work? I haven’t tested it with those, but let me know if you give them a try! Why do you need flour? The flour helps soak up moisture and make them crispy. Hope that helps! This looks so yummy! I would appreciate some advise in preparing the squash. Maybe next time you could video the steps between “whole” acorn squash and “arrange on a cookie sheet”? It never goes well for me! Any tips would be greatly appreciated. Smart! I’ll keep that in mind and also add more details to the instructions. I don’t really know how to prepare the acorn squash. Can someone explain? just cut it up with the skin on? Do you eat the skin? Thanks for sharing, Christina! And Kelly, I’ll add more details to the instructions. I think you are missing some of the instructions on how to prepare the squash. How thick are the slices? Skin on? Any hints on slicing? If those are skin-on, gosh, that’s the thinnest skinned acorn squash I have ever seen! I think it would take me the 10 minutes of prep just to get to the point of putting the squash in the oven. 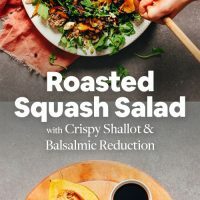 I am going to try this with my excess of Sweet Dumpling squash, though – I don’t love squash by itself, but in a salad, that sounds great! I’ll reduce the roasting time. I used sweet dumplings and it was Delicious! Either sqash will work! Anne, you can really slice the squash however you want, as long as the seeds are removed and they’re in uniform, bite-size pieces! The skin stays on! Good luck. This looks delicious! You don’t peel the acorn squash, can you eat the skin? Def skin on to cook, but don’t eat! You don’t have to peel it! The skin is delicious. Congratulations on your VegNews Best Blog win!!! You are incredible. Thank you for the generous sharing of delicious food with beautiful words and images that spotlight it. Grateful for your cookbook and the continual love and creativity you give to those of us who follow you on this blog. Congratulations on a well deserved win! Stacey, that’s so kind! I didn’t know we’d won or been nominated, so that’s a great way to start my day. xoxo!